Influential sci-fi author Joanna Russ died recently, aged 74. She was one of the first not only to be a major name in a male-dominated market, but to write specifically feminist SF. I was going to compare Joanna Russ to an author who wrote in the same period but is now much more famous: Ursula Le Guin. What I didn’t know until yesterday was that Russ’s blistering short story “When It Changed” was directly inspired by Le Guin’s The Left Hand of Darkness. Le Guin tried to break down gender expectations by showing universality – in Left Hand she has a planet of genderless people. What Russ was infuriated by was that the pronoun “he” was still used in that novel by default. Joanna Russ was not aiming for that universality – she was all about binary. Her message wasn’t that gender expectations shouldn’t be forced onto individuals, it was that women are oppressed by men. Right now. Le Guin was often much more subtle – despite many aspects of feminism (and anti-patriarchy) in her most famous books such as the Earthsea Trilogy, she wouldn’t be as specific as this until she wrote Tehanu. In later novels such as Voices it is quite a few pages from the start of the book before the reader even discovers that the narrator is female – it is simply not important. With Russ, it was central and vital. It’s tempting to look at some of the first feminist SF in the 1960s and 70s as being too enthusiastic: less considered or accurate because it had to shout twice as loud and was opening new ground. Russ did shout loudly, but she was dead right, and wow could she show it. I’ve heard one account personally (and another on the internet) of women reading When It Changed and crying in the bookshop. It is only 8 pages long, and describes the coming of four men to a planet which suffered a plague 30 generations ago; all the male colonists have died, and women now reproduce by artificial fertilisation. They marry, work, explore, fight duels, and it doesn’t occur to anyone that men could be part of the picture. When the four newcomers greet them, their assumptions are so alien that the two groups can barely hold a conversation. It won the Nebula award and was nominated for a Hugo. It is bitterly sad, and the men’s repeated assurance that “they have sexual equality on Earth, now” doesn’t even sound likely to the character saying it. That female-only planet is an important part of Russ’ best-known work The Female Man. There, it is one of four places which she uses to explore the situations women are imprisoned by and wonder what could be instead. There is a version of the real world (at the time of writing); a much poorer America where the female character’s only hope for survival is marriage; the all-female planet from her previous short story; and a world where men and women are openly fighting a cold war against each other. It is a staggeringly influential book. I can remember seeing it on every library sci-fi bookshelf since I was a child. The number of authors who quote it or write about it is huge. There is an entire book named On Joanna Russ. The explicitly binary approach I’ve mentioned above can read offensively now, though Russ also shared many ideas in common with third-wave feminism and was a voice in later decades too. She praised Buffy when it first started, and was positive about slash fiction. But Joanna’s writing is not without its critics, especially regarding one aspect of The Female Man. There is a section (in the alternate world which has men and women openly at war) where any men deemed less masculine than others are used degradingly as ‘substitute women’ by the others. It is extremely offensive to trans people, and there is discussion online about how much this should count against Russ today. Her focus on a strict male/female binary was very much a product of the time, and she (quite truthfully) illustrated how men can bully those perceived as weaker, and how femininity in men is almost always linked with weakness, from the school playground onwards. (This is exactly what I was talking about in my post on modern alpha males, and why they can’t allow themselves to ever be seen to be ruled by a woman, even briefly.) The issue of Russ’s writings in the 70s is more complicated than that, though, and we’re hoping to look at that decade’s approach in more detail here on BadRep at some point in the future. Russ did, at least, retract her views in later life, albeit in an interview given at a convention rather than in any published work. For now, it should be noted that we’re not recommending her work without reservation – there are criticisms which need to be recognised. Generally though, she continued to be acclaimed as a feminist in recent years after producing non-fiction works such as How To Suppress Women’s Writing and also further fiction. Her sci-fi isn’t as famous with modern readers as I feel it ought to be. When I was scouring the library bookshelves as a child and teen, her name (highly ranked in Feminist SF circles) never came up as a force in mainstream SF. I think it deserves to – When It Changed hasn’t lost any of its urgency or relevance, and I’ll certainly be reading The Female Man this week. Here’s to a visionary and ground-breaking author who was able to brilliantly show the incredible web of assumptions and rules which not only affected women’s lives, but affected how they were allowed to write about it. Rarely has someone been able to show men’s assumptions as the intrusive, arrogant and bewildering prisons they can be. 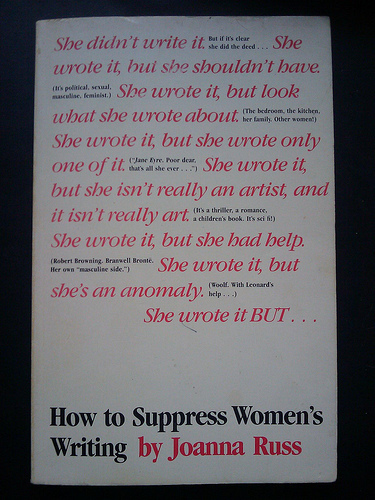 I read "How to Suppress Women's Writing" last year and it was painful how true it was, and really comforting at the same time to have it all laid out like that. I definitely recommend it. Hi, sorry I am late to this, and many thanks for the links. Regarding the Russ apology, a reason why there is nothing in print is that she had been very ill for many years and wasn’t able to write at all. Had she been producing more work I am fairly sure she would have addressed the issue, because she was never one to duck a controversy. I’m always more annoyed with feminists who still hold the book up as faultless than I am with Russ herself.